Et Tu, Mass Effect 3? Mass Effect 3 has broken more hearts than Giacomo Casanova. No amount of soap-opera drama on the Normandy SR2, multiplayer nor downloadable content (DLC) can mend that wound. Bioware should be happy that they have the generally un-killable Commander (Insert name here) Shepard to back up the franchise. If they didn’t, they’d be spaced by now. Commander Shepard, like the Master Chief (Halo), J.C. Denton (Deus Ex), the Vault Dweller (Fallout), the Dovahkiin (Skyrim) and countless other über-hyped video game protagonists, has cemented his (or her) position in the minds of gamers worldwide as an avatar of colossal proportions. Part Captain Kirk, part Luke Skywalker and part Jack Bauer, this amorphous hero(ine)/anti-hero(ine), this larger-than-life messianic/demonic savior/destroyer of the galaxy, is one of the most popularized video game characters in recent times. It’s one thing to save Earth. That’s been done to death a million times over. 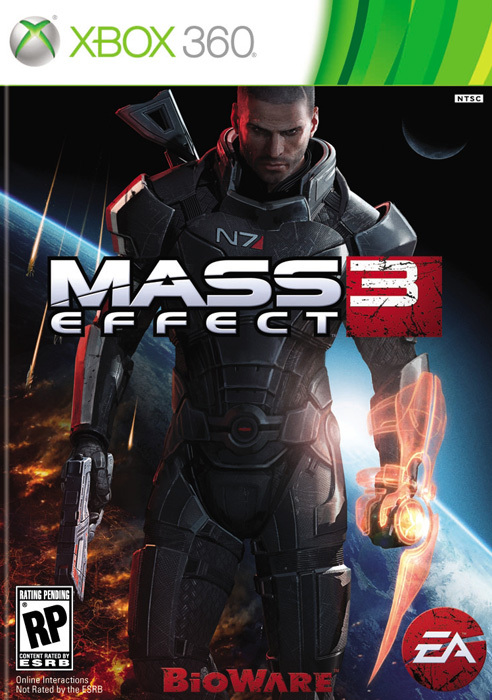 In Mass Effect 3, released by Bioware, a subsidiary of Electronic Arts (EA), Commander Shepard, played by Jennifer Hale (female, “Femshep”) and Mark Meer (male, “MaleShep”), respectively, is tasked with saving the entire Milky Way from an enormous fleet of monolithic robots, the “Reapers,” that want to kill off every single technologically advanced race. To do this, Shepard must single-handedly unite entire planetary systems of warring alien species and, simultaneously, ward off a splinter group of human-supremacists, Cerberus, led by the “Illusive Man,” played by Martin Sheen (Yes the Martin Sheen). Lets not forget managing and, if the mood strikes, romancing members of his/her crew in between the constant galaxy-saving suicide missions—oh, and feeding the fish in the captain’s cabin. It must be said that the Mass Effect series is one of the most beautifully crafted pieces of character and action driven narratives not only in video games, but the entire history of media. It’s a paradigm shifter—at least it would be, if the final ten minutes of the last act didn’t negate the entire point of the 5-year-long franchise, leaving its fans wandering the streets like lost and abandoned puppies. The ending of Mass Effect 3 is akin to a star Olympic gymnast performing a dazzling, history-making routine but, instead of sticking the perfect landing and wowing the judges to a shimmer of camera flashes, they fall on their face, break their neck, soil their pants and start crying. It will go down as one of the biggest letdowns in video game history that rivals even the travesty of Duke Nukem: Forever. Ignoring the ridiculously horrible ending, which is tough, the rest of the game is astounding. Every decision made since the first Mass Effect plays into the plotline of the third. The storytelling and character interactions are top notch, as expected. The narrative runs deep, alluding to many advanced philosophical concepts and moral dilemmas. Chances are players will get quite misty eyed at some parts. At others, legitimately angry. The game makes the player feel the weight of Shepard’s decisions, his/her victories and failures. Could Shepard have saved his/her friend by making peace with their enemy? Does Shepard cure an artificial disease put in place to stop a violent species from reproducing to aid the war effort? Does Shepard gut-punch the man who tried to kill him/her? What could the consequences be? Is it the right decision? Is there a “right” decision at all? Is there a “right” or “wrong” to begin with? What’s a Shepard to do? Bioware has a knack for writing amazing characters as well. Joker, played by Seth Green, the wisecracking ace pilot with brittle bone disease, Admiral Anderson, played by Keith David (Yes the Keith David), the paternal cheerleader who always has Shepard’s back, Mordin Solus, played by William Salyers, the fast-talking and guilt-ridden Salarian scientist, Tali’Zorah nar Rayya, played by Liz Sroka, the shy Quarian Mechanist, Garrus Vakarian, played by Brandon Keener, the ego-driven Turian ex-cop with an axe to grind, etc., all of them grow on the player like wall ivy. Their interactions with both Shepard and each other make them more believable and alive than any video game has ever accomplished. It’s uncanny how human they all are—even if they’re mostly aliens. The company also sets the industry standard for customizable protagonists, alongside powerhouses like Bethesda (Elder Scrolls series) and Lionhead Studios (Fable series), dating back to 1998 with Baldur’s Gate. However, the cinematic qualities of the game set it apart from its peers. It almost pans out like a movie or television series with the player as the star of the show, ducking and weaving through the action, romance and suspense like Rocky Balboa. However, Bioware has shot itself in the foot. They’ve alienated their fans not only with a cop-out ending, but with overpriced day-one DLC. It would be one thing if it was a set of armor or some new weapons, but it adds a practically plot-essential character to the mix. This is a slap in the face to those who have been loyal to the series since the first game. It’s simply in bad taste to make those already spending about $60 to spend an extra $10 to get the full game on release day. It hurts, like a knife in the back. When push comes to shove, Mass Effect 3, even with the-ending-that-must-not-be-named, is definitely one of the best games of the year so far. There is so much fan service, so much attention to detail and so many witty Easter eggs that it’s hard to hate, even for its glaring shortcomings. Still, Bioware has tens of thousands of angry fans to answer to. Only time will tell if they cave to the demand for a new, more comprehensive ending.